what's cooking in my kitchen! Preheat the oven to 375 degrees F. In a medium bowl, combine graham cracker crumbs, sugar, cinnamon, and melted butter, and stir to combine. Press mixture firmly into the bottom and up the sides of a 10-inch pie plate. Bake for 6-8 minutes until crust is golden. Remove from oven and set aside to cool. When crust is completely cool, pour caramel sauce evenly over the bottom and sprinkle with chopped pecans. Set aside. In a large skillet, melt 5 Tablespoons butter over medium-high heat. Using a wooden spoon, stir in cinnamon and brown sugar until combined. Add apples and cook until apples are tender and liquid has reduced, about 20 minutes. Let cool for 10 minutes before pouring into prepared crust. Lower oven temperature to 350 degrees F. In a medium bowl, beat cream cheese and sugar until smooth, then add vanilla, egg, and lemon juice and beat again. 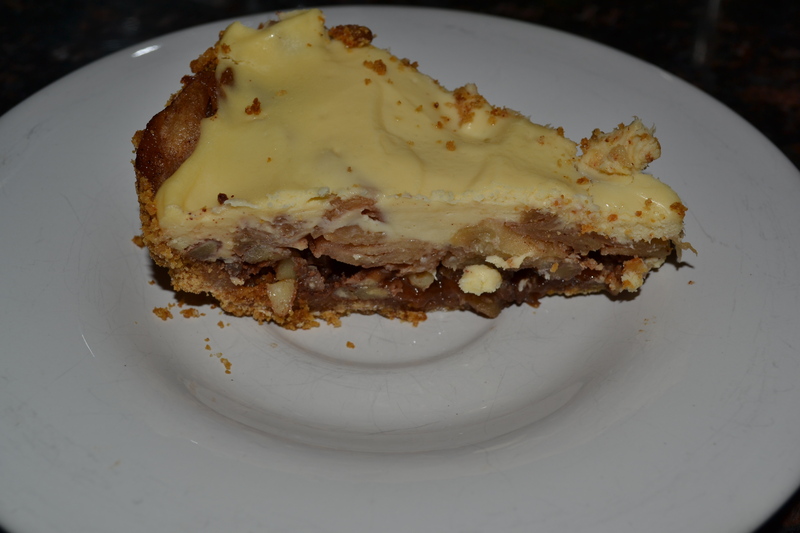 Pour cheesecake topping over apple filling and bake pie for 30 minutes, until cheesecake is completely set. Remove from oven and let cool, then refrigerate until chilled. Let stand at room temperature for 30 minutes before serving.